Bed and breakfast in Ambleside. Ambleside is at the heart of the southern lakes region. The cosy Ambleside centre consists of a cluster of grey stone houses and shops and the ancient market cross, on the circular one-way system that loops round south of the narrow gully of stony Stock Ghyll. The rest of Ambleside lies a mile south at Waterhead, a harbour on the shores of Windermere that is filled with swans, ducks and rowing boats. Ambleside is easy to get to, being only 20 miles from the M6 motorway, and only 4 miles from Windermere. Ambleside offers all you would expect from a typical Lake District village with its lake, the scenery, walking, climbing, specialist shops, museums and excellent pubs and restaurants. Many good walks are possible directly from the centre of the town. Also see Ambleside & Ambleside attractions. If you are in the right town but cannot find the accommodation you want on this page, you might consider Ambleside hotels. Ambleside is a 5-minute walk away. In the heart of the Lake District, this country house hotel offers an AA rosette restaurant, free Wi-Fi and award-winning breakfasts. Lake Windermere is only 400 metres away. Each spacious room at the family-run Hotel Rothay Manor has satellite TV, radio and tea/coffee facilities. Ambleside is a 5-minute walk away. Built in 1825, Rothay Manor Hotel is a Grade II Listed house with landscaped gardens and period features. Rothay Manor has fresh flowers, antiques and lounges that are ideal for afternoon tea or pre-dinner drinks. Cycle hire, horse riding and golf can be arranged, and Rothay Manor has a fishing permit that you can use for free. Guests have free use of a nearby leisure club. Less than 10 minutes' walk from Ambleside, Situated on the shores of Lake Windermere, The Waterhead Hotel offers free Wi-Fi, on-site parking and luxury spa passes, and is centrally located for exploring the Lake District. Less than 10 minutes' walk from Ambleside, The Waterhead Hotel sits between mountains and lakes, within easy access of walking and cycling routes. Wray Castle and Windermere town are a 10 minute drive away. Guests receive free passes to the Low Wood Leisure Club, which features a swimming pool, jacuzzi, sauna, gym and squash court, and is just 1 mile from The Waterhead. The hotel has an on-site bar and separate restaurant for guests. The Bay Bar offers sunset views across the lake, and the modern Bay Restaurant serves fresh, local produce. The spacious, en suite rooms offer flat-screen TVs, and many have lake views. All rooms have slippers and tea and coffee making facilities. Less than a mile from Lake Windermere, in the centre of Ambleside, Smallwood House is a family-run guest house. Free access to Salutation leisure facilities is available for guests. Built in 1880 using local Westmoreland slate, Smallwood House retains its period charms while providing up-to-date facilities. Free Wi-Fi is available throughout the hotel and all rooms have en suite bathrooms and TVs. A freshly cooked Cumbrian breakfast is available and can be served in the dining room or brought to your room. Packed lunches can also be provided and drinks are available in the lounge. The Salutation leisure facilities are just a 2-minute walk away and offer both rainy-day activities and spa facilities including an indoor pool, sauna and jacuzzi. Just a short stroll from Ambleside's village centre, this beautiful Victorian house has excellent breakfasts and boutique-style rooms, many with views of the fells. Wi-Fi is free. Brantfell House has a Visit Britain Silver Award and the owners, Chris and Jane, aim to offer a relaxing stay with personalised service. There is a welcoming lounge with a traditional log fire, and free access to the nearby Low Wood Leisure Club. Brantfell is an ideal base for exploring the Lake District and for activities such as rambling, climbing, cycling and water-sports. Ambleside has shops, pubs and restaurants. Set in the picturesque village of Troutbeck, this charming guest house provides individually decorated bedrooms, most of which have views of the surrounding Fells. All bedrooms feature a shower and a bath, a DVD player and tea and coffee making facilities. The breakfast is served in the dining room, which boasts countryside views; there are 2 restaurants in the village which serve lunches and evening meals. 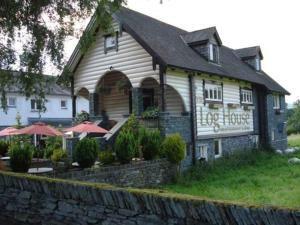 High Fold Guest House is less than 3 miles from Windermere and the Lakeshore, and approximately 4 miles from Ambleside. The Rothay Garth is a traditional Lakeland guest house with beautiful mountain views. Set in the heart of Ambleside village, The Rothay offers en suite rooms and free parking. Rooms all come with satellite TV's and tea/coffee making facilities. Hearty breakfasts are served in the conservatory and packed lunches can be made to order. There is also a lounge area to relax in. The guest house has easy access to Ambleside and Lake Windermere is just a 10-minute walk away. Perfectly situated to discover the Lake District there are plenty of walks very close by. Set in the historic Rydal Valley, amidst the fells, sits Crow How Country Guest House. Just a 10-minute walk from Ambleside the Crow offers spacious rooms with stunning countryside views. Clean modern rooms are en suite and all have TVs and radios. All rooms have seating areas and most have king sized beds. Most rooms have no shared walls. Wi-Fi is available. Crow How Country Guest House serves a traditional Cumbrian feast for breakfast. Guests can relax in the lounge and also enjoy a nightcap in the Crow's Nest Snug. The shop and restaurants of Ambleside are just a stroll away, whilst Grasmere is only a 10-minute drive. At Waterhead catch frequent boat trips to Bowness and Lake Windermere. The Crow provides a visitor pack highlighting the many attractions of the area, including bus and boat timetables. There are also five golf courses within an hour drive. With spectacular views, The Log Cabin sits in the heart of the Lake District. Offering 3 en suite rooms with LCD flat-screen TVs, the Cabin also has a fantastic restaurant. Rooms feature double beds and an en suite shower room with free bathroom products from the White Company. Rooms also have DVD players and free Wi-Fi is available throughout the Cabin. Built over 100 years ago, this historic Norwegian log cabin retains many original features. 2 bedrooms have original log beams and the third has stunning views over the fells. The stylish restaurant offers a relaxed atmosphere in which to enjoy superb food, made with delicious, fresh seasonal produce from the region. Traditional breakfasts are served daily. Set in the heart of Ambleside, the towns' restaurants and shops are just a short walk. Lake Windermere is only 4 miles away and free parking is available. Overlooking Lake Windermere and Langdale Fells, Holbeck Ghyll is a 4-star country house with a Michelin Star restaurant. With sumptuous rooms, Holbeck also boasts a health spa and transfer service. The opulent, individually designed rooms all include beds dressed in Egyptian cotton. Perfumed with fresh flowers, they include LCD satellite TVs, free Wi-Fi, DVD players and a decanter of sherry. A gourmet menu and international wine list is on offer at the restaurant, which has stunning views of Lake Windermere. In fine weather canapes are served on the terrace. Using organic products, many relaxing treatments are available at the health spa. Guests can also unwind in the sauna and steam rooms. Holbeck's exclusive transfer service can provide collection to and from stations and airports. They offer helicopter transport, which can include a tour of the Lakes. Free parking is available on site. In Ambleside, 800 metres from Lake Windermere, the family-run Lakes Lodge guest house offers en suite rooms and a full English breakfast. It is a bike-friendly guest house. Each stylish room has fresh light decor. As well as an en suite bathroom, each room has a TV and DVD-player. A range of DVDs are available from reception. The buffet breakfast includes full English and continental items. Lakes Lodge is licensed and offers wine and beer room service. Lakes Lodge offers free car parking and a lock-up area for motorcycles and bicycles are available. Free Wi-Fi is available throughout the property. Rydal Water is 1.8 miles away. Windermere Railway Station and town centre is 4.5 miles away, providing access to the World of Beatrix Potter, the Steamboat Museum and boat trips. This family-run country house has spectacular views across Waterhead Bay, Windermere, Loughrigg Fell and the Langdale Peaks, and offers stylish, modern and luxurious accommodation. A full English breakfast is served every morning. Set in large, beautiful gardens, only a minute from the shores of the lake and the pier and jetties at Waterhead, the guest house is just a short walk from the shops, cafes and restaurants of Ambleside. It has a terrace where guests can relax weather permitting. Elegant and modern, the en suite rooms have CD players, tea/coffee making facilities and large, modern TVs. All rooms overlook Ambleside, The Bay and Fells and they have a free DVD library. Guests can borrow a PlayStation 2. Cherry Garth is a charming guest house at the Heart of the English Lake District offering a delicious breakfast. All rooms have en suite facilities and beautiful views. At Cherry Garth Guest House, each room is individually decorated with warm colours, wooden details and comfortable beds. They come with toiletries and tea/coffee making facilities. The landscaped garden features pretty lawns, attractive sitting areas, an ornamental pond and a wide variety of flowers and bushes. Windermere Railway Station is 10 minutes away and the hotel is less than five minutes walk from both the centre of Ambleside and Lake Windermere. In the centre of Ambleside, close to all the amenities, Churchill Inn has modern, comfortable rooms, a good breakfast and free private parking. Guests can choose a room with a bath and a shower or with just a shower. They all feature an LCD TV and tea/coffee making facilities and some have views over Loughrigg Fell. Churchill's Grill offers a traditional menu. There are 2 bars: the larger Popular Bar and the more tranquil Monty's Bar with an open fire. Hot and cold bar snacks are served daily. Churchill Inn is just 5 miles from Windermere Train Station and the nearest bus stop is only 50 metres away. The bed and breakfast is close to the centre of Ambleside and scenic walks. Lake Windermere is about 10 minutes' walk away.This refurbished Ambleside bed and breakfast offers free Wi-Fi and bedrooms with a jacuzzi bath, shower and king-size bed. It is a short walk from many local eating places. Brathay Lodge was built around 1890 and is very well located for walkers, mountain bikers and golfers visiting the Lake District. Free parking is available. Some rooms at Brathay Lodge have Lakeland views and some have direct access to an outside covered seated area. The bed and breakfast is close to the centre of Ambleside and scenic walks. Lake Windermere is about 10 minutes' walk away. With wonderful countryside views, this stylish hotel is 2 minutes from the centre of Ambleside. It offers free Wi-Fi , a tasty breakfast and free access to a local spa. All the bedrooms have en suite facilities and hairdryers and guests can enjoy free tea and coffee making facilities. The Gables Guesthouse Ambleside has a spacious dining room providing traditional English cooking with continental and vegetarian alternatives. Locally sourced products are used where possible. The Gables has membership to the Langdale Country Club and Spa, which offers free access for all guests. It is a 10-minute drive away. A drying room and secure bike storage are available on request. Built from traditional Lakeland stone, Hillsdale in Ambleside offers fresh cooked breakfasts and bright bedrooms with en suite bathrooms. In the centre of beautiful Ambleside, there is also free parking. The family-run Hillsdale Guest House offers rooms with decorative cushions and colourful artwork. All rooms have tea and coffee facilities with indulgent chocolate biscuits, and feature a TV and hairdryer. The impressive breakfast menu offers full English or vegetarian options, alongside a selection of fresh fruit and juice. There are also a number of local restaurants within comfortable walking distance. Hillsdale Ambleside is centrally located for exploring the nearby fells and lakes, with Lake Windermere just 15 minutes' walk away. The owner's offer expert local knowledge, and can assist with leisure and travel arrangements. In the English Lake District, Elder Grove offers award-winning breakfasts, and a quiet bar with free tea and coffee and free Wi-Fi. Ambleside town centre is a 5-minute walk away. A superb breakfast is served in the cosy, traditional dining room, including award-winning homemade jams, preserves and bread. A freshly cooked Cumbrian breakfast made with local produce is available. The individually decorated en suite bedrooms feature digital TV and locally made toiletries. The hosts are welcoming, and there are folders with local area information. Elder Grove guest house has a lounge with a fireplace, a TV and a DVD player. A PlayStation and games are also available, and the friendly bar serves local beers. Guests receive free passes to Langdale country club, where there are spa and gym facilities. There is free private parking, and Keswick, Windermere and Coniston are all within easy reach. We are a 3 diamond, no smoking Guest House in Ambleside, the heart of the Lake District. For hotels accommodation in other areas near to Ambleside Cumbria see Bowness on Windermere hotels & Keswick hotels.